One corner of Honolulu that we found ourselves returning to throughout our two-day visit was Kapahulu Avenue. This neighborhood runs from the north side of the Honolulu Zoo (which is at the south end of Waikiki) to the H1 freeway near Chaminade University of Honolulu. The approximately two-kilometer distance is gentrifying nicely, with lots of long-time shops rubbing shoulders with a new Safeway supermarket. On our visits there, we ate a breakfast and a dinner. 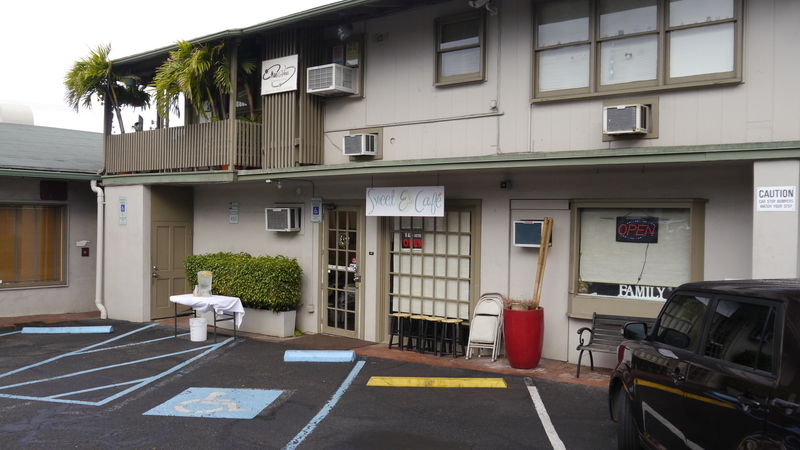 Located in a small shopping complex kind of hidden off Kapahulu Avenue near the H1 freeway, Sweet E’s Cafe is one of the higher-rated breakfast places on Yelp.com. To be certain, I take Yelp reviews with a few large grains of salt. That said, it looked like a good bet for a decent Saturday breakfast before we started driving around the island. Arriving early, we found the dining room less than half full. From the reviews, I get the impression that the restaurant is very crowded later in the morning. The interior is pleasant and the servers were helpful, if not exactly warm. Poached eggs with Kalua pork. My big beef with lots of places is that their poached eggs are overcooked. This time, the problem was that the eggs were undercooked. In my mind, the perfect poached egg has solid but not rubbery whites, with runny yolks. When I cut into the first egg, the whites were still watery inside. It was right on the line between “worth sending them back” and “not worth sending them back,” so I didn’t. As the watery whites soaked my English muffins, though, I regretted my decision. The pork and the sauce were tasty, so points there, but the potatoes were bland and would have benefitted from some herbs or spices. Tawn ordered a basic waffle with maple syrup. It was pleasantly crisp, cooked to just the right point. 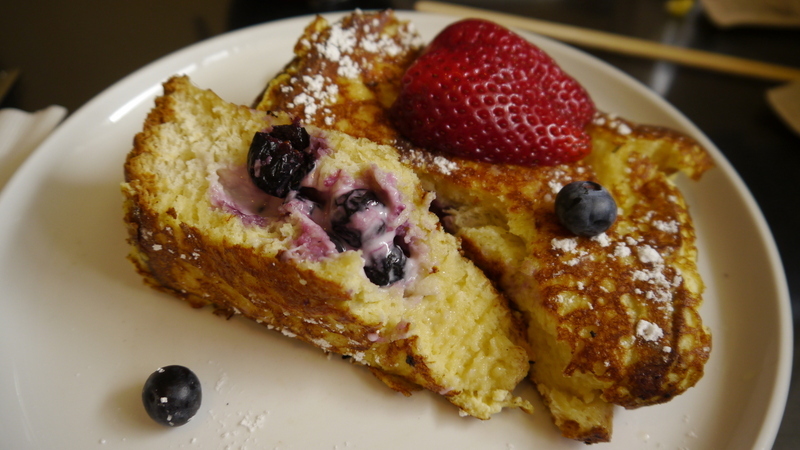 We also ordered French toast stuffed with cream cheese and blueberries. The toast itself was nicely done but the blueberries inside the toast were tough, leading me to conclude that they use frozen blueberries for the stuffing and only place fresh berries as garnish for the plate. Overall conclusion: Sweet E’s didn’t show such a sweet face for us, at least as far as quality. It has the potential to be very good and if we lived there, we would give it another chance to redeem itself. 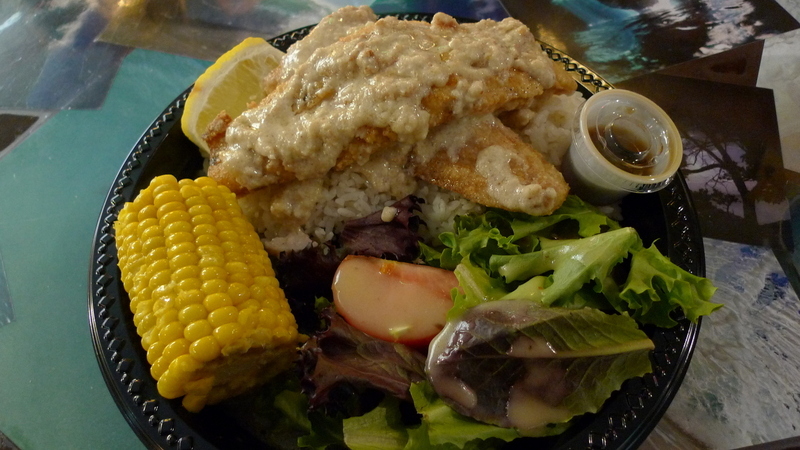 But if you are just visiting, I would suggest you search out Boot’s & Kimo’s in Kailua. On Friday evening, we found ourselves looking for a tasty dinner that didn’t involve a lot of expense or effort on our part. Turning to Yelp.com, I searched for “cheap seafood dinner” in Honolulu. 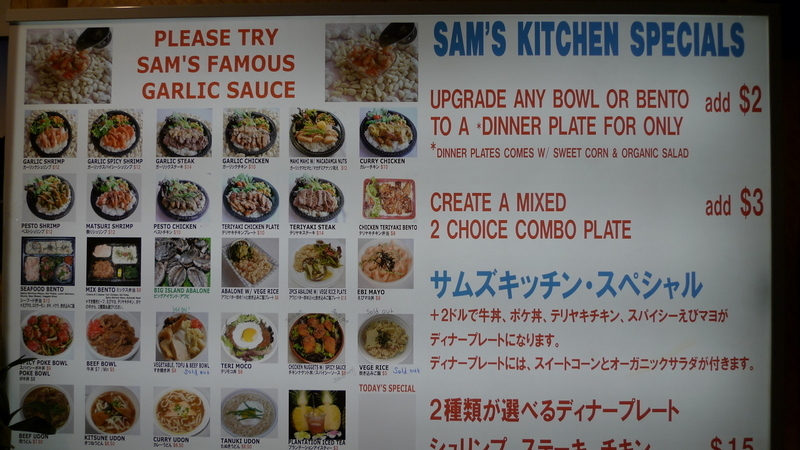 Sure, that’s probably the last place you want to eat – somewhere serving cheap seafood – but we got a result whose high ratings were accompanied by thoughtful reviews: Sam’s Kitchen. 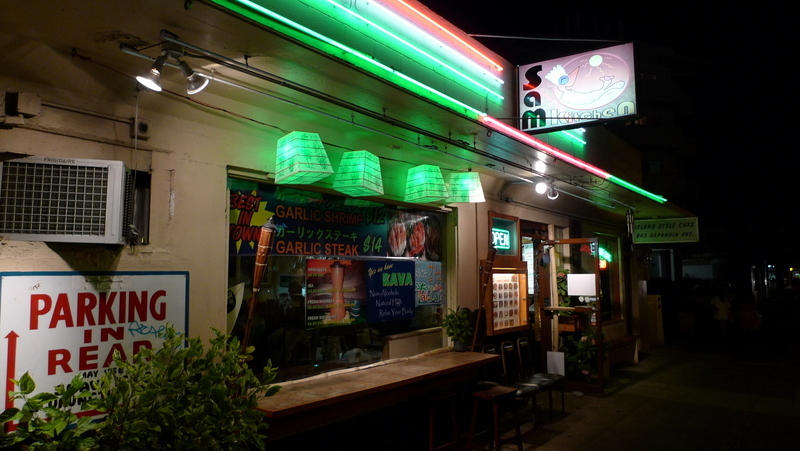 Located on Kapahulu Avenue right across from a new Safeway shopping center, Sam’s has a slightly retro dive bar appearance. When we arrived about 8:00, we were charmed by its exterior but baffled (and slightly worried) by its almost vacant state. 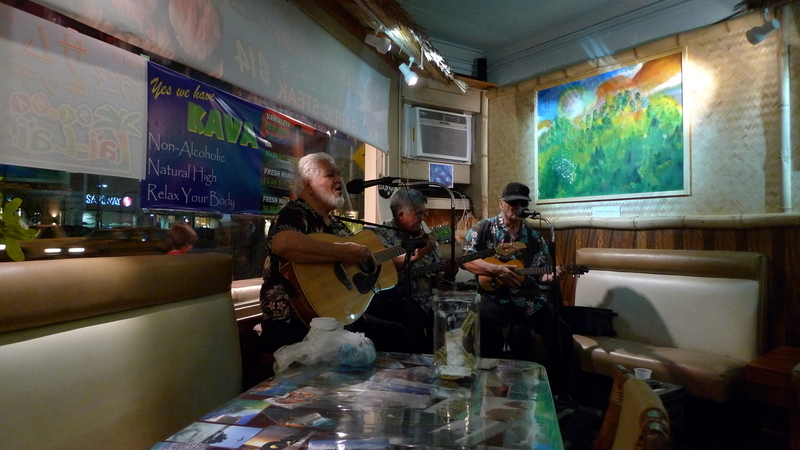 We entered and found only a half-dozen customers (if that) listening to live Hawaiian music. I felt a little conspicuous walking in during their performance – after all, it wasn’t like we could sneak in unnoticed. The lady behind the counter was welcoming, though, so we figured out the menu and placed our order. 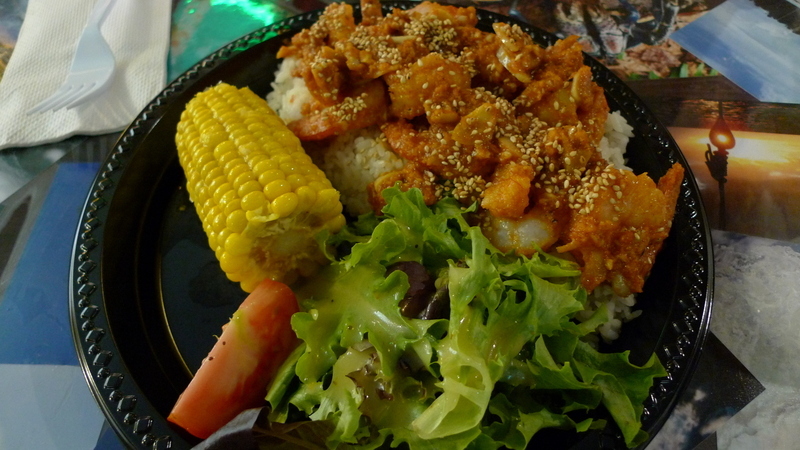 Tawn tried the spicy garlic shrimp rice plate, which came with a salad and a half-ear of corn. This was good food – the shrimp is tender and sweet and the garlic packed a punch – and stayed with us for the next day. 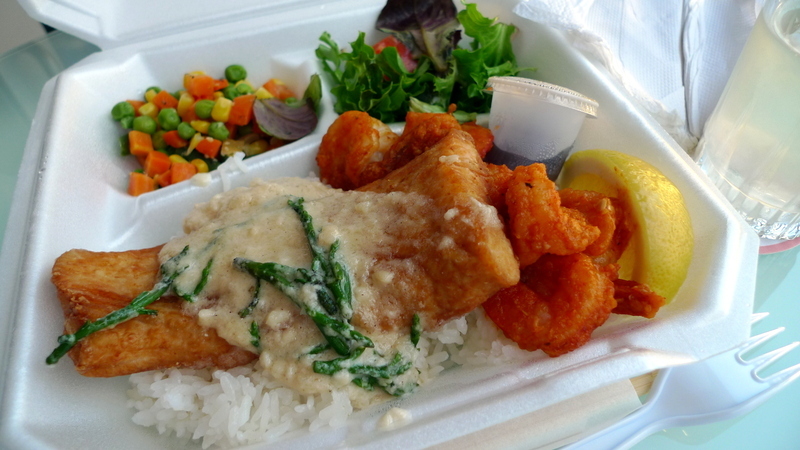 I had the fried mahi mahi with macadamia nuts. 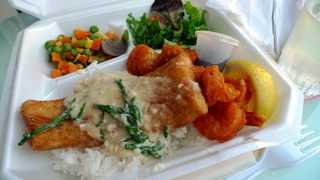 The fish was very fresh, lightly breaded, and the sauce was tasty. Both dishes were simple, inexpensive, huge, and excellent. So much so that on Saturday night, our second and final night on Oahu, we decided to visit Sam’s again. 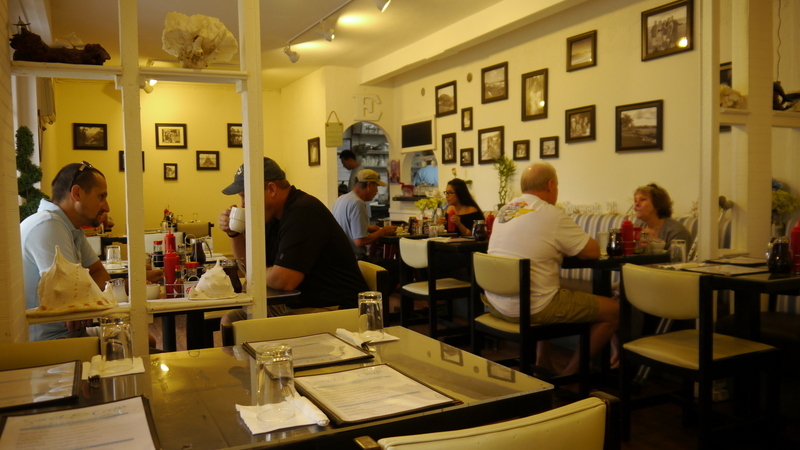 This time we stopped at the original location on Royal Hawaiian Avenue in Waikiki. 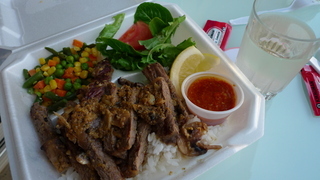 This location is take-out only, although it does offer some self-service tables if you can’t wait to get back home to eat. 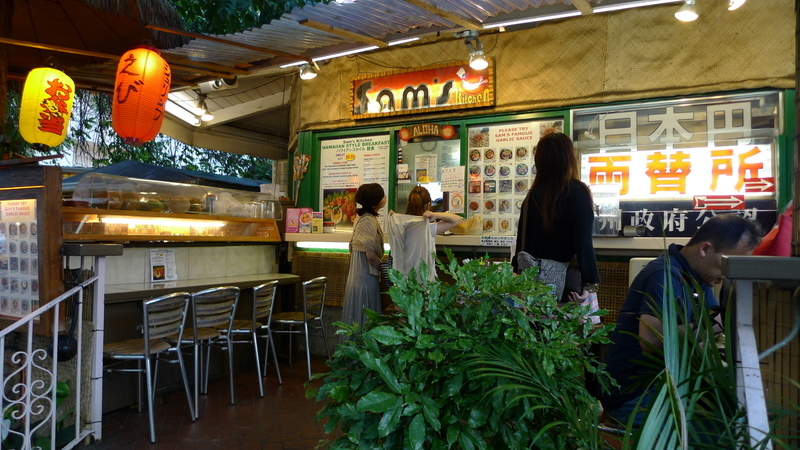 The menu is the same and the customers were mostly Japanese. Tawn ordered a combo plate (left) with the same two items we had the night before, but half a portion each. On the right, I ordered a garlic steak plate. The steak was tasty, although pretty tough. 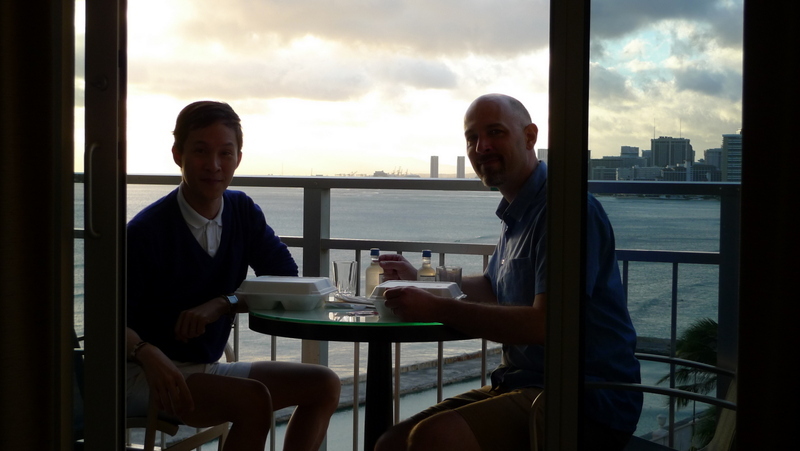 With two small bottles of wine from the convenience store downstairs, we celebrated our last night on Oahu with a sunset dinner on our balcony. 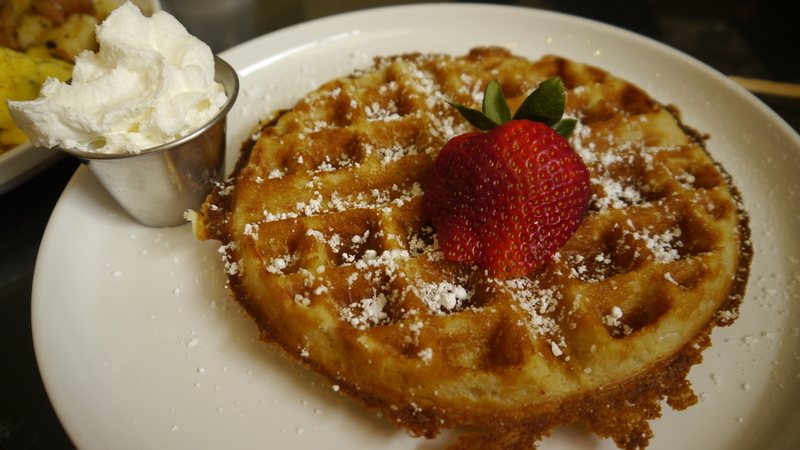 This entry was posted in Uncategorized and tagged Avenue, breakfast, Brunch, Dining, food, Hawaii, Honolulu, Japanese, Kapahulu, kitchen, Oahu, Restaurant, sam, sam'skitchen, Seafood, sweete's, Waikiki by christao408. Bookmark the permalink. These mom ‘n pop restaurants served up a nice meal indeed! The places are not too crowded on weeknights, I suppose? I am one of the people who always ask the locals – sometimes the housekeeping staff – at the place I am staying where they like to eat. It may take a question or two more but I usually get led to a mom and pop place that serves good food and sometimes too much of it. Seems to work a good big of the time. I’ll have to try yelp.com. Never heard of it before. Too bad that the eggs were so under done for your breakfast. I too sometimes think too much, and feel bad later… should have sent the plate back. First instincts are always the best I think. That garlic shrimp dish looks good. I can smell the garlic …. I’m reading this having had only an apple so far… eggs aren’t that hard to do right. Fishies yum…. no moco loco? that was my favorite when i was on the big island. @grannykaren – Honestly, I don’t care that much for the loco moco – really heavy (read “hearty,” you like…) and not that nuanced, flavor-wise. 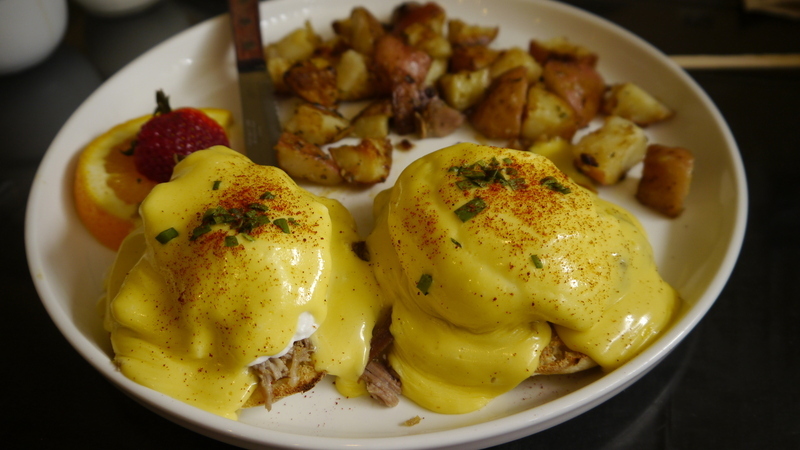 @murisopsis – Well, I have a hard time perfecting poached eggs, too… but then I don’t charge for them so the diners’ expectations should be lower. @ElusiveWords – It was really, really garlicky, as in “smell that garlic seeping from your pores the next day?” garlicky. @vsan79 – Sorry to make you hungry! =(@ZSA_MD – I think you are right; if it wasn’t the way it should be, I shouldn’t hesitate to (politely) ask for the dish to be changed. @Inciteful – It can be a handy resource for finding restaurants and reading others’ opinions of them. You just have to bear in mind that sometimes people aren’t well-equiped to evaluate restaurants! For example, I read a review in which a lady was upset because the restaurant wasn’t able to accomodate her at dinner when she walked in with no reservation. As a result, she gave the restaurant two stars. How could she possibly evaluate the restaurant if she never ended up eating there? @Fatcat723 – That’s my technique, too. Last time we were in Chiang Mai, we went with the recommendations of several of the hotel staff, who agreed that two restaurants were their favorites. Turned out, they have good taste! @CurryPuffy – We were at Sam’s Kitchen on a Friday and Saturday night, so not sure why they wouldn’t have been particularly crowded. May be tourist low season? @slinky – A blue tongue? That’s funny!